You are here: Home / giveaway / current giveaways / Amazon Twitter Blast – Win a $100 Amazon GC! Amazon Twitter Blast – Win a $100 Amazon GC! I just caught a spider. And by caught, I mean shrieking when I saw it scurry across the carpet, looking frantically for something to catch it with, and grabbing the first thing I could to “catch” it and keep it from running out of sight. 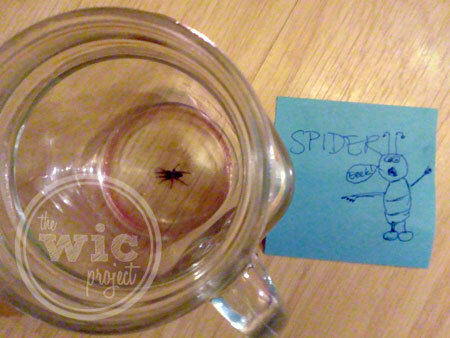 The result – a spider trapped under a glass. After posting a picture on Facebook with the question “Now what?” I followed Nicole’s advice and left a note for Gil. I’m not sure what kind of bug I drew, but it doesn’t like spiders either. On another note, we’re bringing you another chance to win a $100 Amazon GC in this week’s Amazon Twitter Blast! This is such a great giveaway that Makobi Scribe has every week. I have never won one, but you never know it could happen someday! Thanks for the giveaway!